The "M&M Boys" were the duo of New York Yankees baseball players Mickey Mantle and Roger Maris, who were teammates from 1960 to 1966. [lower-alpha 1] They gained prominence during the 1961 season, when Maris and Mantle, batting third and cleanup (fourth) in the Yankee lineup respectively, both challenged Babe Ruth's 34-year-old single-season record of 60 home runs. The home run lead would change hands between the two teammates numerous times throughout the summer and fueled intense scrutiny of the players by the press. Maris eventually broke the record when he hit his 61st home run on the final day of the season, while Mantle hit 54 before he was forced to pull out of the lineup in September because of an abscessed hip. Near the beginning of the season, New York Yankees manager Ralph Houk decided to switch Mantle and Maris around in the batting order, having Maris bat third and Mantle cleanup instead of vice versa. This is cited as an advantage for Maris, as opposition pitchers were reluctant to pitch around him, as this would result in Mantle coming up to the plate to bat. As a result, pitchers gave Maris better pitches to hit for fear of walking him. At first, the batting order switch appeared to have little effect on Maris, who hit only one home run in April. However, he gained momentum in the home run race in May and June, slugging 11 and 15 home runs, respectively. On the other hand, Mantle started off the season strong, hitting 14 home runs by the end of May and 11 homers in June. At the end of June, it became clear that both M&M Boys were on pace to challenge Babe Ruth's 1927 single-season home run record. However, their chances of breaking Ruth's record were dealt a heavy blow on July 17, when Ford Frick, the Commissioner of Baseball, ruled that a player would have to hit more than 60 home runs in 154 games[lower-alpha 2] in order to break Ruth's record. Frick, who was a good friend of Ruth and served as his ghostwriter, added that a "distinctive mark" would have to be added should the record be broken after 154 games. Roger Maris is honored with a plaque (left) in Monument Park, while Mickey Mantle's plaque was mounted onto a monument (right) upon his death in 1996. ↑ These years marked Maris' tenure with the New York Yankees. On the other hand, Mantle played his entire career with the Yankees. ↑ The 1927 season consisted of 154 games. With the addition of the Los Angeles Angels and the Washington Senators into the American League in 1961, the number of games in a season was expanded to 162 games in order to maintain a balanced schedule. 1 2 "Roger Maris Statistics and History". Baseball-Reference.com. Retrieved July 29, 2012. 1 2 "Mickey Mantle Statistics and History". Baseball-Reference.com. Retrieved July 29, 2012. 1 2 "A Short History of the Single-Season Home Run Record". National Baseball Hall of Fame. Retrieved July 4, 2012. [Maris] and Mantle...broke the record for most single-season home runs by a pair of teammates. 1 2 3 4 5 6 7 Singer, Tom (August 24, 2011). "Plenty of duos have look of M&M Boys". MLB.com. Retrieved July 30, 2012. ↑ "New York 500 Home Run Club Mickey Mantle – Yankees". ESPN New York. ESPN.com. June 2, 2010. Retrieved October 14, 2011. 1 2 3 4 5 6 7 8 9 10 11 12 13 14 15 Acocella, Nick. "Maris battled Mantle, media and Babe's legacy". ESPN Classic. ESPN Internet Ventures. Retrieved July 30, 2012. ↑ "As Trade Roger Maris To Yankees". Reading Eagle. AP. December 12, 1959. p. 10. Retrieved July 30, 2012. 1 2 "Most Valuable Player MVP Awards & Cy Young Awards Winners". Baseball-Reference.com. Retrieved July 30, 2012. 1 2 "Baseball Awards Voting for 1961". Baseball-Reference.com. Retrieved July 30, 2012. 1 2 3 4 5 6 7 8 9 Marlin, John (August 1, 2004). Mickey Mantle. Twenty-First Century Books. pp. 81–82. Retrieved July 30, 2012. 1 2 3 4 5 6 7 8 9 Vincent, David; Stark, Jayson (March 31, 2007). Home Run: The Definitive History of Baseball's Ultimate Weapon. Potomac Books, Inc. pp. 110–111. Retrieved July 30, 2012. 1 2 3 4 5 6 7 8 Barra, Allen (July 27, 2011). 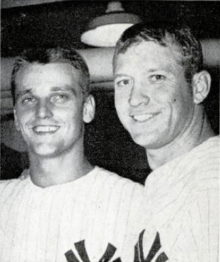 "Roger Maris's Misunderstood Quest to Break the Home Run Record". The Atlantic. Retrieved July 30, 2012. ↑ Schwartz, Larry. "Mantle was first in fans' hearts". ESPN.com. Retrieved July 30, 2012. Fans rooted against Roger Maris, and they urged Mantle on. But Maris broke the record with 61, while injury and illness halted Mantle's pursuit. He had to settle for 54, a career best and the most ever for a switch-hitter. ↑ Vecsey, George (August 20, 2011). "50 Years Later, Maris's 61-Homer Season Looks Even Better". The New York Times. Retrieved July 30, 2012. [A] wave of sadness remains from 1961, when Maris realized the baseball establishment was rooting for Ruth to hold on to his record or for his friend Mickey Mantle to be the one to break it. ↑ "Decades later, Durante has rich memories of Maris – MLB – ESPN". Sports.espn.go.com. February 11, 2011. Retrieved August 8, 2012. 1 2 "1961 World Series (4–1): New York Yankees (109–53) over Cincinnati Reds (93–61)". Baseball-Reference.com. Retrieved July 30, 2012. ↑ "1974 Hall of Fame Voting". Baseball-Reference.com. Retrieved August 9, 2012. ↑ "1988 Hall of Fame Voting". Baseball-Reference.com. Retrieved August 9, 2012. ↑ Reiter, Ben (January 14, 2010). "Maris family hoping for Hall call". Sports Illustrated. Retrieved August 9, 2012. ↑ Chass, Murray (September 5, 1991). "Baseball; Maris's Feat Finally Recognized 30 Years After Hitting 61 Homers". The New York Times. Retrieved July 30, 2012. ↑ Durso, Joseph (December 15, 1985). "Roger Maris is Dead at 51, Set Record Home Runs". The New York Times. Retrieved July 30, 2012. 1 2 Barkhorn, Eleanor (July 27, 2011). "Chasing Babe Ruth: 6 Myths About 1961's Home Run Race". The Atlantic. Retrieved July 30, 2012. ↑ Sandomir, Richard (April 25, 2001). "TV Sports; When Mantle and Maris Chased Babe Ruth's Ghost". The New York Times. Retrieved July 30, 2012. ↑ Chandler, Bob; Swank, Bill; Swank, William G. (2006). Bob Chandler's Tales from the San Diego Padres. Sports Publishing LLC. p. 91. ISBN 9781596700246. Retrieved September 25, 2012. ↑ Wulf, Steve (April 16, 1984). "The Beast Team In Baseball". Sports Illustrated. Archived from the original on September 25, 2012. ↑ Naiman, Joe; Porter, David (2003). The San Diego Padres Encyclopedia. Sports Publishing LLC. p. 86. ISBN 9781582610580. Retrieved September 25, 2012. ↑ Naiman, Porter 2003, pp.90, 92, 98. ↑ Lemire, Joe (May 18, 2009). "Mauer continues to display why Minnesota needs him long term". Sports Illustrated. Retrieved July 30, 2012. ↑ "Yearly League Leaders & Records for Batting Average". Baseball-Reference.com. Retrieved July 30, 2012. ↑ "Silver Slugger Award Winners – American League". Baseball-Reference.com. Retrieved July 30, 2012. ↑ "American League Gold Glove Award Winners". Baseball-Reference.com. Retrieved July 30, 2012. ↑ "Hamilton sets record with 28 HRs in first round of Derby; Morneau wins it all". ESPN. ESPN Internet Ventures. Associated Press. July 15, 2008. Retrieved July 30, 2012. ↑ "Baseball Awards Voting for 2008". Baseball-Reference.com. Retrieved July 30, 2012. ↑ MPR: The Bleacher Bums: The reluctant "M"